Three people were seriously hurt when their boat crashed into the harbour entrance at Cowes on the Isle of Wight. Minutes earlier the group were told by police not to set off because it appeared they had been drinking and had no life jackets or lights. The boat, with five people onboard, was trying to cross the Solent when it hit the breakwater on Thursday night. One person suffered spinal injuries and two others head injuries. All three were taken to hospital. Coastguards were alerted by the crew of another boat, who had seen a badly damaged RHIB (Rigid Hulled Inflatable Boat) attempting to berth on the Town Quay at West Cowes at about 2315 BST. Ambulance and police were also called to the scene and the four men and a woman, aged about 35 to 55 years old, were all accounted for. Solent Coastguard said the crew had been advised by Hampshire police not to attempt returning to Hayling Island as they were deemed too drunk. But shortly afterward the vessel did attempt to leave Cowes at speed and hit the breakwater. The collision caused the forward sponsons to deflate and the console and steering wheel were badly damaged. 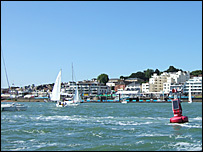 Nigel Guyll, Solent Coastguard watch manager, said the type of speedboat they were on is capable of speeds of up to 60mph. He said: "You wouldn't dream of driving down the motorway at 60mph drunk. "They were taking a terrible risk. If they had hit something mid-Solent flat out at 60mph, it would be a different story. "No lifejackets, no lights on the vessel whatsoever. They are very lucky they hit the breakwater and didn't go out into the Solent. "It's illegal on a commercial vessel to drink but that law hasn't stretched to the leisure trade yet. But they are going to change it. "Any sane person would want that law changed." Cowes Harbour Authorities are investigating the incident. More than 8,500 competitors in 1,000 boats from 14 different countries are taking part in Cowes Week on the Solent. Friday is the last day of the eight-day event.